Stags are everywhere at the moment, and in Dorset we have an especially soft spot for these majestic creatures. Stags are everywhere at the moment, and in Dorset we have an especially soft spot for these majestic creatures. Charborough House, known locally as the Drax Estate has a stag guarding one of the entrances in the wall which surrounds the estate. As one of the longest brick walls in Britain, the wall and stag gate are something of a local landmark. Here are some of our favourite stag themed house wares from our favourite Dorset creative’s. 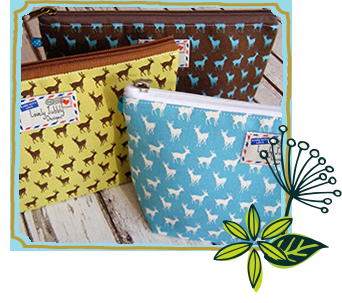 Quirky printed wash bags make the perfect gift for nature fans and animal lovers. Lovely Jubbly have some delightful designs which are all cotton and lined with a waterproof lining. From stags to reindeer, Made Lovingly Made's wooden stag head is easily adapted to become Rudolf. It can also be personalised and comes from Christchurch. We’d love to dress up his ears with some twinkly lights. Bring a touch of nature to your gift wrapping with an on trend stamp from The English Stamp Company. We think this design would be perfect on brown parcel paper. 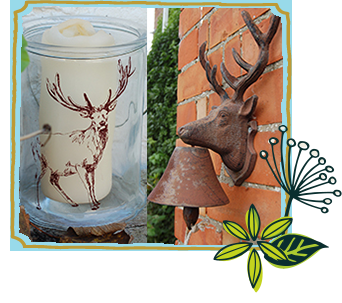 Perfect for your Christmas table, or for lighting up your garden, a beautiful stag print hurricane lantern from Hunter Gatherer would pair nicely with a glittery or cinnamon scented candle. Jingle all the way with a rustic iron stag door bell. The perfect addition to any country manor or cottage door. 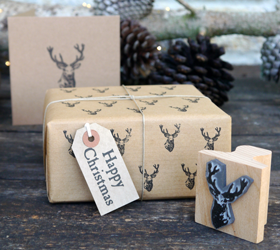 Stag Stamp, from £4 English Stamp Company - view the full Christmas collection! Win one of 5 packs of stag gifttags! 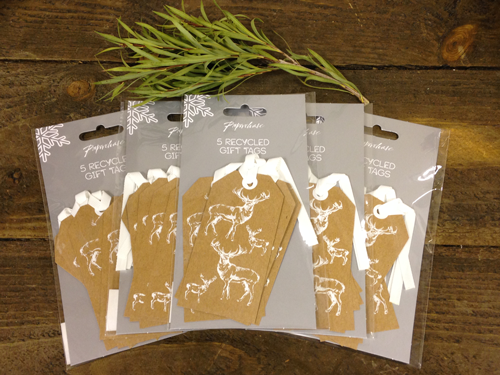 To celebrate all things stag, we are offering you the chance to win one of 5 stag gift tag packs from Paperchase.